HOUSTON, TX – April 11, 2013 – SmartVault, a leading provider of SaaS online document storage and secure file sharing solutions, announced today that newly launched enhancements to the SmartVault-QuickBooks Online integration process focuses entirely on improving the user experience—from the initial account provisioning all the way through attaching a document to an entry in QuickBooks Online. Main enhancements include streamlining the authorization process and offering an interactive ‘helper’ for step-by-step setup guidance so a user can get up and running on the service in minutes. “We are committed to providing QuickBooks Online customers with a completely integrated and interactive experience for setting up the SmartVault service. We put a great deal of thought into these new enhancements, which are designed to guide users through every step of the process of downloading and integrating SmartVault for QuickBooks Online into their workflow,” stated SmartVault founder and CEO, Eric Pulaski. 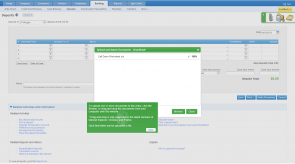 Streamlined Authorization Process—Offers users a simple and intuitive process for authorizing access of the SmartVault for QuickBooks browser extension. New Interactive ‘Helper’—Supports users with on-screen instructions to help them easily complete set up from account provisioning to attaching a document to the integrated SmartVault Toolbar. SmartVault recognizes the need for superior cloud-base online document storage, while also realizing the need for creating a rich customer experience from the start. These new enhancements were designed with the user experience at the forefront. SmartVault for QuickBooks is available to all QuickBooks Online users right from the Intuit AppCenter. SmartVault offers a free 30-day trial and a subscription of $9/month once the trial is over. To learn more or start a trial of SmartVault for QuickBooks, visit the Intuit AppCenter at http://appcenter.intuit.com/smartvault.